Made fresh throughout the day . . .
And some of your favorite additions! Thank you for helping us to reach the #2 Ice Cream Parlor ranking in the US in 2017! Trip Advisor ranks Bellvale Creamery #2 among Top 10 Ice Cream Parlor’s in the United States! Open daily from 12 noon! The Creamery is located at 1390 Route 17A, Warwick, NY. Open April 1 through October 30. Open at noon every day; closing time depends on the season. Featuring homemade ice cream served in cones, sundaes, or homemade waffles cones. 50 flavors, plus ice cream cakes, pies, and take-home quarts! Please Note: We love your pets as much as you do but we don’t love them inside the creamery. For safety of all, only service dogs are allowed inside the building. The Buckbees also exemplify the creativity and dedication required to remain in farming in an area with growing development pressure. During the past decade, they have taken several steps to ensure its future. They were among the first farmers to sell their development rights to the Town of Warwick’s farmland preservation program. With the proceeds, they purchased additional acreage and made their operation more economically viable for current and future generations. With the involvement and skill of that next generation, they have diversified their operation to include a Creamery, which produces homemade ice cream and caters to daily commuters and hikers from the Appalachian Trail, as well as local residents. Eventually they plan to become a fully operational dairy-processing creamery and will produce and sell cheeses, milk, yogurts and other dairy products. They were also among the first farmers in the area to adopt rotational grazing of their herd, which assures not only the high quality of their milk but the sustainability of the local environment. Their stewardship, including careful manure management, is credited with protecting a rich underground aquifer that is relied upon by thousands of people, and ensuring that brook trout continue to spawn in the streams that run through their fields. Official recharging station for A.T. hikers’ devices, canteens, and relaxation! The first section of the A.T. opened in Warwick in 1931, six years before the official opening of the entire Appalachian Trail. The Town has been welcoming hikers ever since and was named an A.T. Community™ in 2012. The Town of Warwick is centrally located on the A.T. between High Point in New Jersey to the west and the Bear Mountain Bridge in New York to the east with easy road access to this entire 65 mile section. The Village of Greenwood Lake in Warwick with many hiker amenities can be accessed directly from the A.T. using the Village Vista Trail. The Pochuck, Wawayanda and Wildcat Shelters on the AT are easily accessed from Warwick and can be used in planning section hikes (no reservations or permits required). With ample road access and parking within and in the immediate vicinity of Warwick, A.T. hikes of all ability levels can be accommodated. 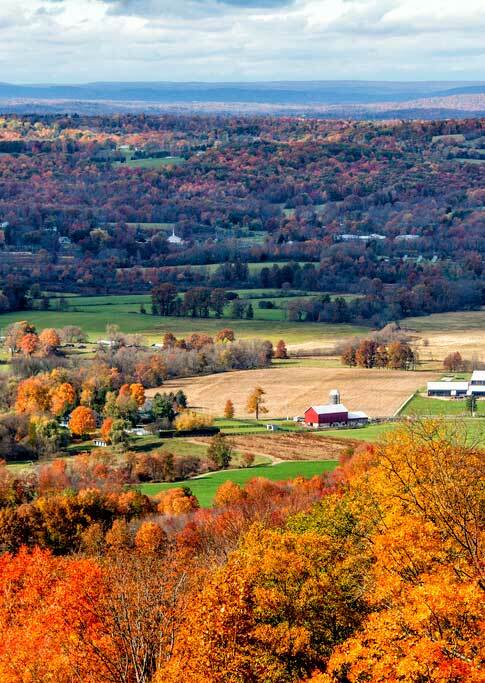 The Wallkill River National Wildlife Reserve, the Pochuck Boardwalk and suspension bridge, the “Stairway to Heaven” at Wawayanda Mountain, spectacular views of the Warwick Valley and Greenwood Lake, and Fitzgerald Falls are all within Warwick or at our immediate doorstep, literally just a few minutes away in neighboring towns. A little further within a 45-minute drive is the beautiful Delaware Water Gap, the clear and clean waters of the upper Delaware River, the NY-NJ Trail Conference’s spectacular Bear Mountain A.T. rehabilitation project featuring over 1,000 hand-hewn granite steps, and the Bear Mountain Bridge which carries the A.T. across the Hudson River built in 1924. Since 1819, Bellvale Farms has provided fine quality dairy products throughout the Hudson Valley region. throughout seven continuous generations of family farming! During October 2011, Bellvale Farms was presented with the Sustainable Agriculture Award from Orange Environment. Bellvale Farms received this prestigious award for its "Commitment to sustainable farming practices including diversifying grain crops, working with the Warwick Valley Winery to provide them with locally produced grains, and returning their dairy products and crops as value-added products to benefit the local community.